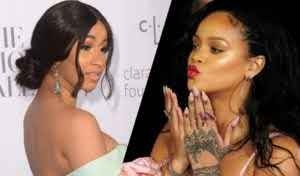 Famous music star, Rihanna may have just picked a side in the feud between Cardi B and Nicki Minaj .The singer has decided to unfollow Cardi B on Instagram. Cardi B and Nicki Minaj have been beefing hard ever since they got physical at the Harper’s Bazaar ICONS bash a week ago. But while many of them would rather remain neutral and not get involved at all, a select few have made their allegiances clear. Rihanna is not the only celeb to support Nicki through the feud with Cardi, her ex, Chris Brown is also supporting Nicki on this one. One source previously told HollywoodLife that ‘Chris is loving the drama between Nicki and Cardi. He is glad this is one beef that he is not involved in, so he can enjoy all the action and just watch. On the other hand, Tiny Harris and her rapper husband T.I. are supposedly trying their best to remain neutral because they are friends with both women.